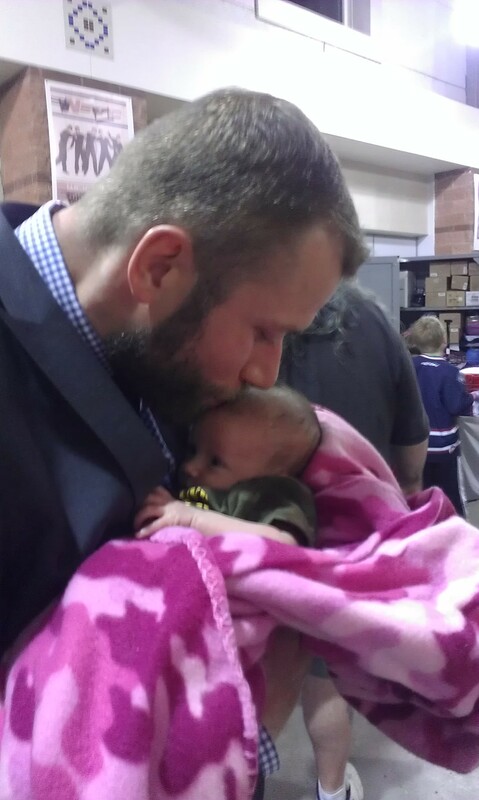 At just four weeks old, I wasn’t really ready for Talia to have her first kiss, but alas, she did. The Stingrays won their 18th straight game last night, which happened to also fall on the ULTIMATE Pi Day (3.14.15…which is exciting since we own Mudd PIE Girl Bakery and PIE is my thing!!!!) 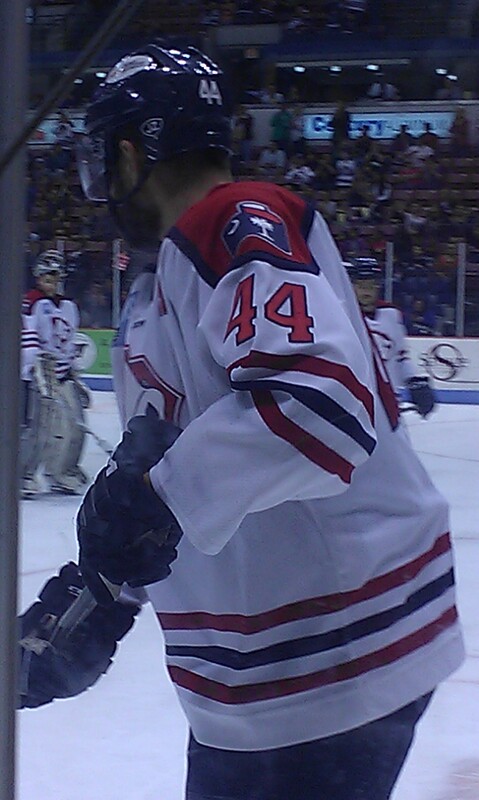 and Military Appreciation Night with the Stingrays. 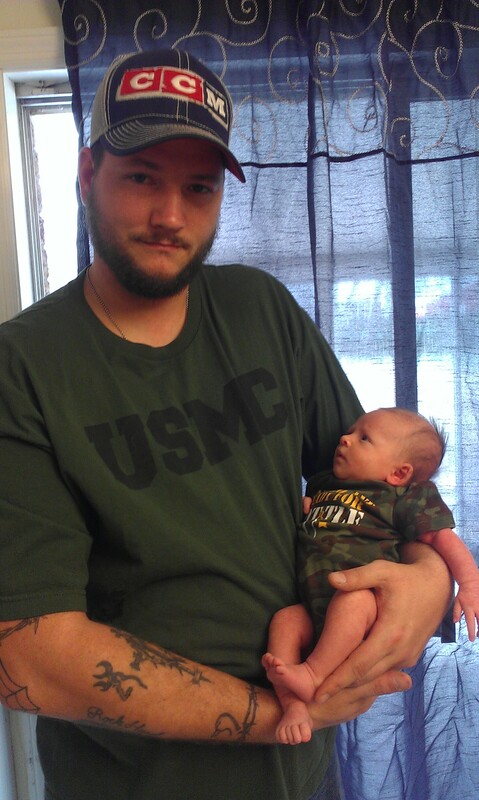 Talia and Bill both had to represent the United States Marine Corps! Here we are getting ready for the game. After dinner with Brian and Michelle (Michelle runs the rescue group where we got our sweet Buddy and Tremor dogs from), we headed over to the game together. 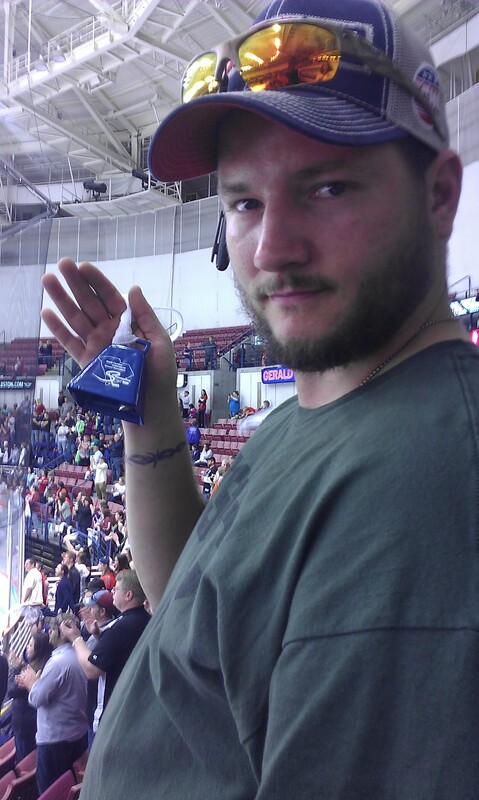 Bill insisted on holding the cowbell all night. Ugh! After the game there was a post-game jersey auction. Then Bill spotted one of our favorite players out with fans. 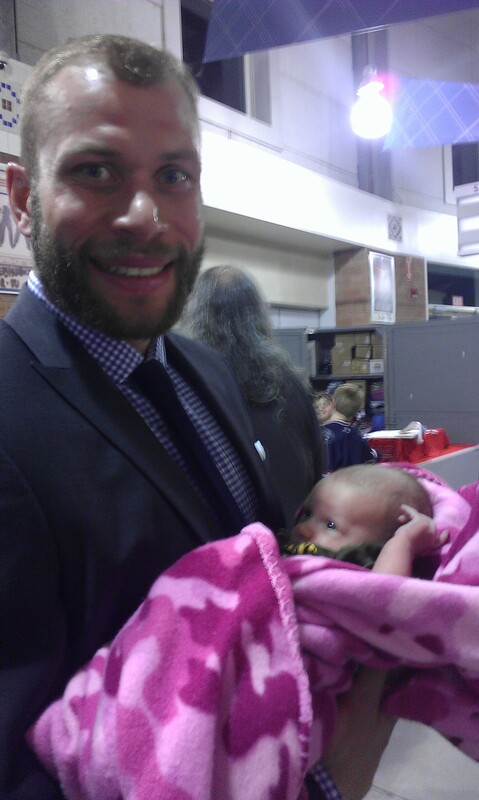 Patrick Gaul (we have his bobble-head doll for Talia when she gets older) was more than happy to hold Talia and pose for a picture. How sweet is this photo??? THEN it happened. My absolute favorite player, Scott Ford was walking around. I asked Bill if he thought Scott would take a picture with Talia. Not only did he take a picture with her….. HE GAVE HER A KISS!!! It was Talia’s first kiss from a man not daddy. Since Bill doesn’t read my blog, I can safely tell you…I’m a bit jealous!!! Today it was back to the ice and the Stingray’s won the 19th straight game, making history AGAIN! It was also “Undie Sunday” where the Stingrays collected undergarments for charity. Look who helped during cleanup, right in front of us. Yes, Talia’s first kiss. 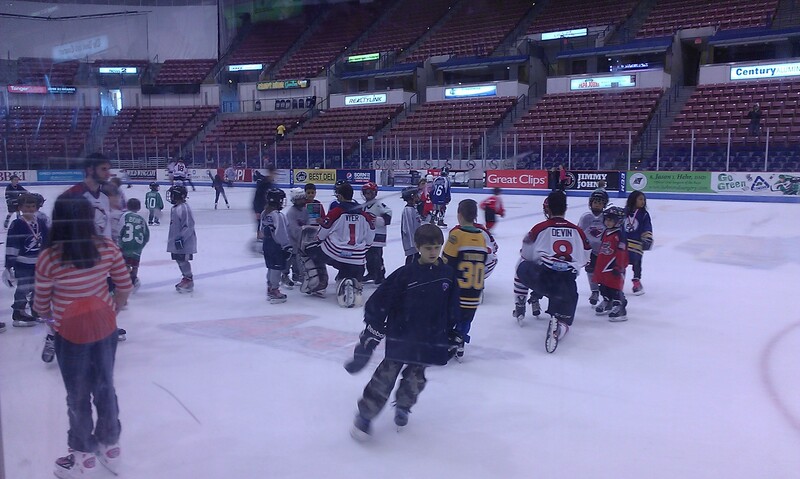 After the game was free-skate time with the Stingrays. Ford saw us, recognized us, and waved. Swoooooooon. 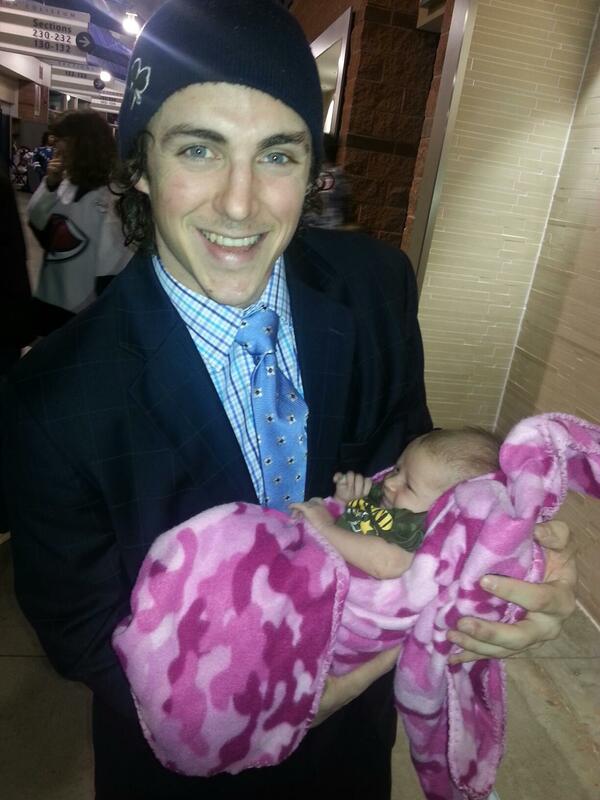 Here is Patrick Gaul with some of the kids. How freaking sweet is this? All the guys are really great with the kids. I can’t wait for Talia to be old enough to skate. Sadly, it won’t be with the Stingrays, since we are moving in August. Hopefully the Hershey Bears do the same type of skate after the game! 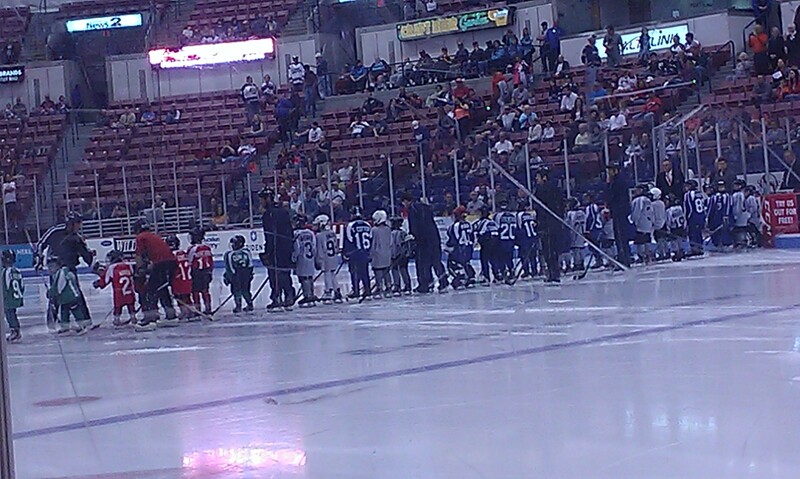 Here the Junior Stingrays were able to come out for the National Anthem before the game. At home I’m working on some articles for publication. I write best at night. They say creative people usually are night owls. If I could sleep all day and be up all night, I would be one happy chick! 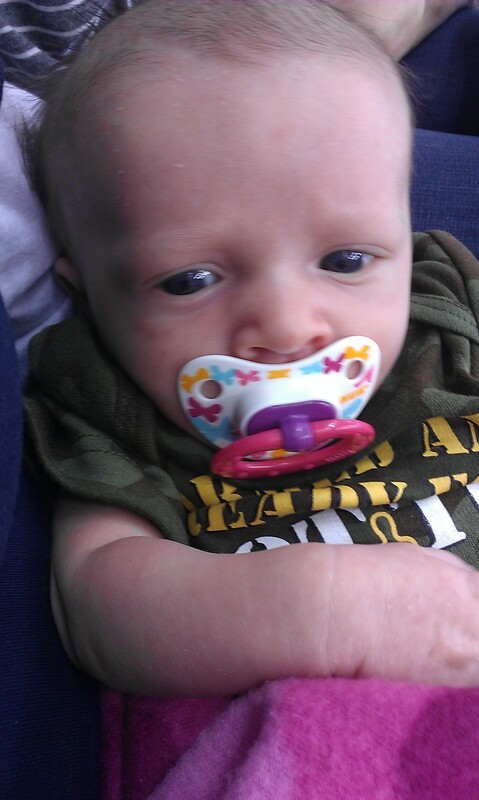 Talia, however, has now slept through the night two nights in a row!!! I’m not really sure why everyone makes such a big deal about having children. Everyone made it sound like I wasn’t going to sleep for 18 years, but I’m fine!! Tomorrow I have a TON of baking to do for some special orders this week!!! I’m so sad to have to abandon my clients here in SC because of the move, but look forward to meeting new people in PA. August can’t get here soon enough! The five year plan is to have an actual storefront bakery in Harrisburg, instead of baking out of the house for private clients!!! With school, baking, writing, and Talia, I’m sure to have a busy week this week. I hope you have a good one!